1 pound store-bought or homemade pizza dough I used the recipe on this site for pizza huts dough. 1/2 cup grated Parmesan divided. Meanwhile, oil 2 pizza pans or large baking sheet. 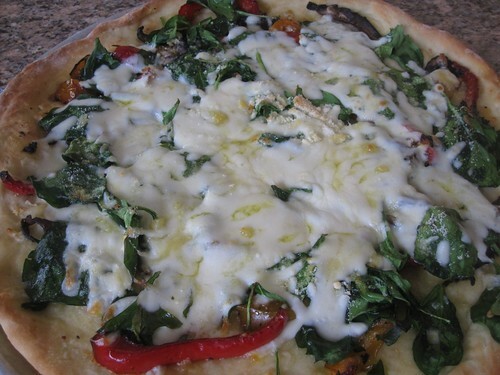 Press the pizza dough onto the pan in an approximately 14-inch round or 9-by-13-inch rectangle. Spread the peppers and mushrooms on the pizza crust. Bake for 10 minutes. Sprinkle on the garlic,2 cloves for each pie, black pepper, and spinach. Top with the mozzarella and then with the Parmesan. Drizzle with the remaining 3 tablespoons oil. Bake until the cheese is bubbling and beginning to brown, about 5 minutes longer. « Barley, Roasted Butternut & Grape Salad.